For the 4th year in a row Hops Connect has held a University brewing club competition in Metro Vancouver called the Hops Connect Cup. The judging was done in the days before the event by local BJCP judges and previous winners of the Winning Beer award. The Hops Connect Cup event was held on November 12th, 2016 at Big Rock Urban Brewery in Vancouver. This year brewing clubs from UBC, UVic, KPU In BC and Olds College from Alberta competed in the brewing competition. Each brewery was challenged to brew multiple categories including Pilsner, IPA, Double IPA, Pale Ale and stout with awards also for best name, winning beer and the Hops Connect Cup best overall school. Hops Connect supplies the hops for these home brews and the students design the recipes. I have unfortunately not been able to make it out to the Hops Connect Cup since the first event they held 4 years ago. Each school either sent or brought samples of the home brews that were entered into the competition so that people from other schools could sample the entries. This year many of the entries were very strong and I enjoyed every sample that I tried. Here are the winning beers from this years submissions. Thanks to Hops Connect for these slides. A good number of students from the university brewing clubs came out to this event to celebrate home brewing and to take home hardware. It is to bad that KPU and Olds College did not have representatives at the event to accept their awards! I would like to congratulate all of the winners and Congratulate Olds College on stealing the Trophy from the province of British Columbia this year! Its always exciting to check out the new up and coming home brewers and this event is a great place to see the upcoming talent. This year had some great talent and previous winners are currently working at local breweries! It is awesome to see that a local Hops company is fully on board to help encourage the future brewers in the craft beer industry to follow their dreams. The coolest thing about this event is that the winner of Best Beer gets to brew their winning beer at a commercial brewery and have it released to the public. This years winner EH.P.A. 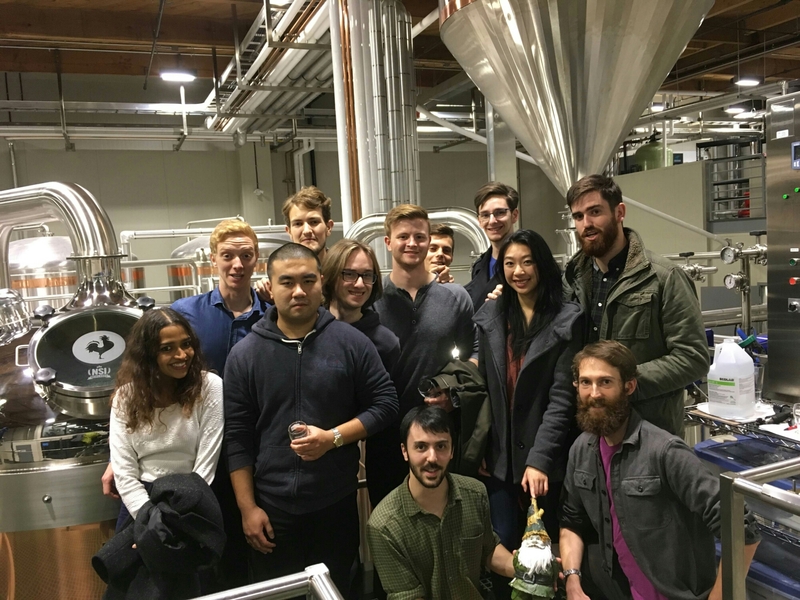 made by members of the UBC Home Brew club will get to brew their IPA beer at Moody Ales and have the beer sold commercially. Keep up the great work Brewing Clubs! Photo from Hops Connect of UBC Brewing club on a brewery tour of Big Rock Urban Brewery. Hops Connect sells hops to commercial brewers, u-brew shops, home brew shops and home brewers. If you fall into one of these categories make sure to check them out with the links below! Hops Connect – Hop Trading Company Ltd. This entry was posted in Beer Awards, Tasting Event and tagged 2016, alberta, bc, big rock urban brewery, british columbia, double ipa, home brew competition, hops connect, hops connect cup, hops connect cup 2016, IPA, kwantlen polytecnhic university, olds college, pale ale, pilsner, stout, tasting event, ubc, university of british columbia, university of victoria, uvic.